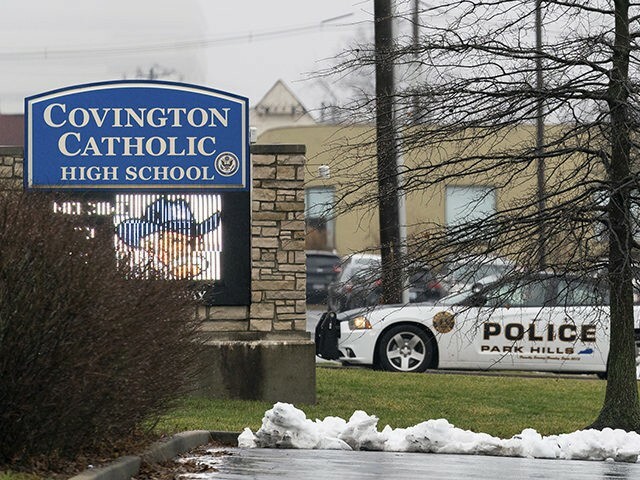 According to Fox 19, the school had readied additional security at Covington Catholic High School for when students return Tuesday following threats of violence issued against the school and its students since the weekend. The American Indian Movement Chapter of Indiana and Kentucky are scheduled to protest at the Diocese of Covington at 10:00 a.m. local time. Initial video of a confrontation between Covington Catholic High School junior Nick Sandmann and Native American activist Nathan Phillips created a firestorm on social media, with media pundits from across the political spectrum accusing the student of disrespecting the man. Sandmann is seen grinning in a red Make America Great Again hat while simply standing in front of Phillips, an elder with the Omaha tribe. Several students could be seen laughing and making hand gestures believed to be mocking Phillips. Yet, subsequent videos show that the students were not only approached by Philips first, but were verbally accosted by a religious group, Black Hebrew Israelites, which have been labeled by the Southern Poverty Law Center as a hate group. In a pair of tweets, President Trump defended the students, stating that they had been unfairly treated by the media and expressed hope that the incident could be used to bring Americans together. “Looking like Nick Sandman & Covington Catholic students were treated unfairly with early judgements proving out to be false – smeared by media. Not good, but making big comeback!” the president tweeted. “Nick Sandmann and the students of Covington have become symbols of Fake News and how evil it can be. They have captivated the attention of the world, and I know they will use it for the good – maybe even to bring people together. It started off unpleasant, but can end in a dream!” he added.